Kusus + Kusus architekten’s BBI-Info Tower at the Capital Airport in Berlin is designed to be a recognizable element for the airport that will “serve the whole region and far beyond the boundaries of the construction site beyond.” Rising 31 meters, the tower is a welcoming sight for visitors approaching by land or passengers on plane. 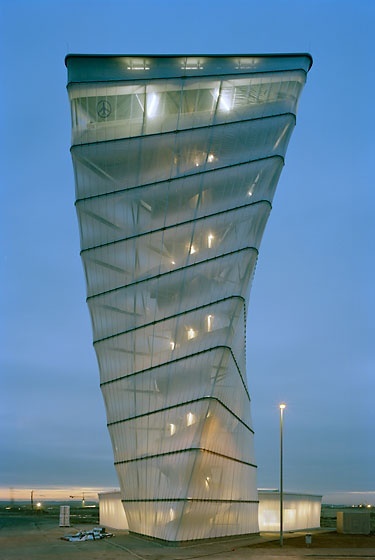 Programmatically, the building is a observation tower that provides views of the “growing” new airport complex which is currently being developed. By ascending to the top, the visitor is then roughly at the level of the surrounding construction cranes and gains new insight into the construction activities.